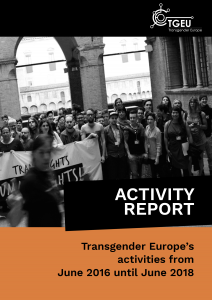 Our activity report looks at TGEU’s work since the 6th European Transgender Council, which was held in Bologna, Italy in July 2016. We cover the different areas of TGEU’s work and will highlight important developments in these areas. An outline of our activities in the last two years is found in the last section. This report should be read alongside our Anti-Activity Report, where we reflect on our challenges and shortcomings. Transgender Europe (TGEU) has grown steadily as an organisation over the past 12 years. We now have 116 group members from 44 countries in Europe and Central Asia. Our work is supported by 7 main funders and donors, and this allows us to employ 11 members of staff, publish an average of 12 publications a year, work with our members and partners, and advocate and campaign on a number of issues. 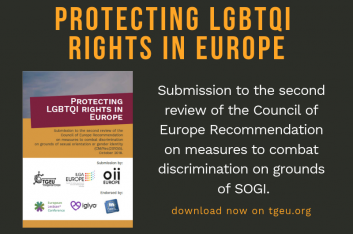 We have contributed successfully to shifting the discourse of trans rights in Europe from one which focuses on medical aspects to one which focuses on human rights. Every two years we publish our activity report which outlines our successes and activities for the period and is presented to our members. Our activity report shares highlights in our different areas of work, lists our activities throughout these two years, and presents financial reports and budgets. However, this time instead of only talking about our successes and victories we are also presenting our anti-activity report. 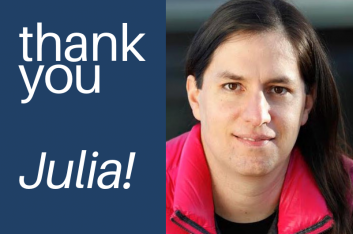 We have recently started to take a power-critical look at our activities and deliverables, at our structures, at our (implied) values, at the ways we work, and have realised that we are leaving many people behind. It’s long overdue that we, the most privileged people within the trans community and within TGEU, open our eyes and realise that despite our successes in producing publications and fulfilling commitments made to our funders, we have also failed. This anti-activity report takes a critical look at our work to underline where we are failing our communities. 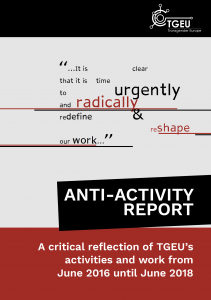 TGEU is grateful for the financial support received from the Rights, Equality & Citizenship Program of the European Union towards the design and printing of this Activity Report and Anti-Activity Report. 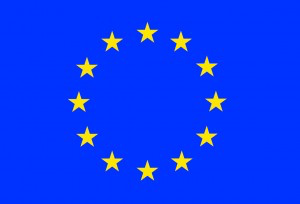 Sole responsibility for contents lays with TGEU and can in no way be taken to reflect the views of the European Commission.